Now there is no excuse to miss the long-awaited, much-requested return of your favoriteâ€¦ DARKWING DUCK. Once St. Canard's greatest protector, Darkwing Duck was known the world over as "The Terror That Flaps In he Night." In the first-four-issue arc, mysteriously, DW has not been seen or heard from in well over a yearâ€¦ and St. Canard finds that evil is once again on the rise. 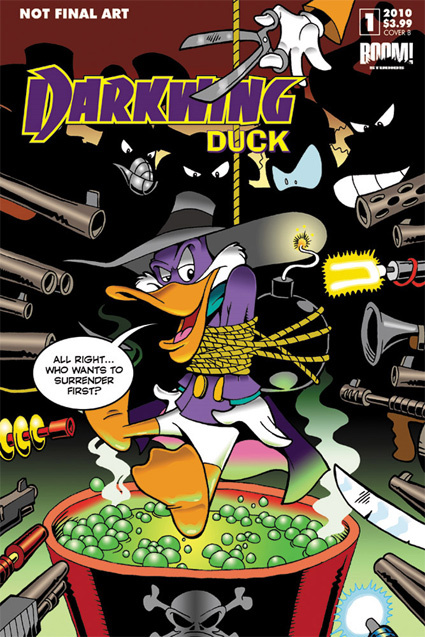 But when a nefarious plan threatens everyone, Darkwing Duck knows… it’s time for the duck knight to return! "LET'S GET DANGEROUS!" with Disney & BOOM! Studios as one of Disney's most beloved characters makes a comeback in his own not-to-be-missed original series! This entry was posted on Tuesday, May 18th, 2010 at 1:27 pm	and is filed under Boom! Studios, New Titles, United States. You can follow any responses to this entry through the RSS 2.0 feed. You can leave a response, or trackback from your own site. That is so cool that Darkwing Duck is going to be a full time series this time. I have the original four issue mini series from when The Walt Disney Company published their own comic books.